Summary : Ride via Terry Hills, Church Point and N. beaches to Manly. Ferry and train back to start. Some hills and traffic. NOTES: Ride distance is 48km to Manly plus 5km from Circular Quay to North Sydney. The CQ to NS section is optional, and might not be led if temperature already 30+. Cancelled if rain likely. Coffee at Warriewood after 30km. This ride winds through the back streets of Turramurra to Mona Vale road. 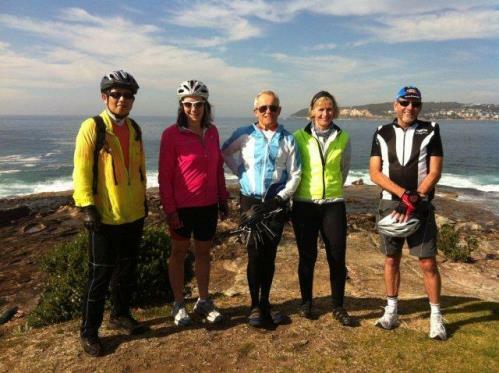 We then ride along Mona Vale Rd through St Ives and Terry Hills and into Ku-ring-gai national park. Then ride down McCarrs Creek Rd to Church Point and on to Mona Vale. The ride then closely follows the coast down to Manly. We catch the Manly ferry for a relaxing cruise to Circular Quay before riding over the Harbour Bridge to catch the train from Milsons Point back to the start at Turramurra.